What made you come to study in Durham (UK)? I am not able to study in Iran – my home country — because I am a Bahá’í. Even though I was always top of my class, I have been banned by the government from entering university or any further education. It’s not just I who have been banned – no young Baha’is, even though many of them are top students in their own fields, are allowed to enter university. Even those who used to be students have been expelled. 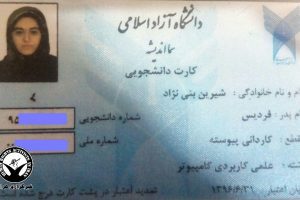 Did you try to enrol in university in Iran? Yes, many times, in many different universities. I wrote letters to the President, of which I have copies, to the Minister of Education, and to the agencies responsible for educational provision. I asked them why I couldn’t be admitted to university and if they could help me. I also wrote letters when I was expelled from my last year of high school. I either had no response, or I was sent an apologetic reply, indicating that the information I provided upon application was insufficient and therefore the admissions process could not proceed. I applied for three or four years in a row. I kept applying, and the form is expensive – around 5000 tumans – but they kept rejecting me. Our forms were considered to be “incomplete” because we didn’t indicate our religion. The Bahá’í Faith was not even an option. My husband took the entrance exam and passed, but he was refused entry into university. Had you experienced discrimination on the grounds of being a Bahá’í before? When I finished my 3rd year of high school, it was necessary to take an exam to pass to the next level (compulsory for all students). There was a form and on it we had to indicate our religion. The only options offered were Muslim, Zoroastrian, Christian and Jewish. As I am not involved in any of those religions, I wrote that I am a follower of the Bahá’í Faith. The school told me I was not allowed to take the entrance exam. I went to the local education authority and they told me that my documents were not complete, although they didn’t indicate which bits, and that I could not proceed further. We tried to study by ourselves. The local Baha’i community gathered together, and tried to teach the children and provide a basic education, but it didn’t work adequately. There was a lack of qualified teachers, especially for my courses in math and physics. Anyhow, we tried to study and read the books. That year was really difficult, but we finished it. Did you finally get any formal qualifications? When I began to study at the college level, I began to take the exams each term, to gain the formal national qualifications. Many others decided not to do this because they thought they might not use it or it didn’t matter. But I myself decided – because it is my right and because, in the future, when I want to go to a formal university, they may ask me for this formal certificate. If I didn’t have it I would face other troubles. How do the Baha’is respond to these persecutions? We pray. We try to help ourselves out of this situation in peaceful ways – for example by sending letters, to campaign for our rights, in a very respectful and polite manner – just mentioning the laws in the constitution of the country, and our basic rights as citizens. What was your school life like before high school? According to Islamic rules, a nine year old girl is mature and should say her obligatory prayers. From that age onwards, all the principles of our schools are forced on us, Baha’is and non-Baha’is. Inasmuch as we believe in the truth of Islam as a religion, we memorized their obligatory prayers and we recited them individually, but they forced us to attend as a group and recite them. We refused to do that, because we were not Muslims, but we told them that we respect their beliefs. A few times I hid somewhere so I didn’t have to attend the group prayer. It didn’t happen to me, but several times my younger sister was punished when she refused to take part. She had to stay out of the classroom in the corridor – just standing. Some children have been expelled from primary school, middle school, and high school. They would go to class as usual, but the principal sent them away. Throughout all these difficulties, how did you feel? When I couldn’t enter my final year of high school, of course I wasn’t happy at my right to an education being withheld. But at the same time I strongly felt that it was my responsibility to try my best to get my right. It’s not just my right! It’s the right of the whole community. If I, as a Bahá’í youth, am granted this right, gradually the whole community can get rights to other things. I always believed it was my right to fight, peacefully, for my right. If I just sit and cry, am disappointed, or leave the country even, it means that I put the whole Bahá’í community in trouble, not just for this generation but also for coming generations. So at the same time, I continue myself to study and also ask some of my friends who are not Bahá’í to share their notes with me. Some have refused to have contact with me, but most help me a lot and are so nice, so positive. They just say that they are ashamed of what the government has done to the Baha’is. They have been so helpful to us. It was very difficult. I don’t want to complain because I really think that I’ve been one of the lucky ones. Even though I faced some difficulties in trying to further my education, there have been lots of youth who’ve been expelled from their universities since the revolution. They have been unable to study for different reasons. Some cannot afford to enter the BIHE. We have to travel from our city to Tehran to do the classes. Others cannot because they’re busy with their jobs. Because they lost everything due to the revolution. Since the revolution, Iran’s economic situation has become worse and worse. For the Baha’is, who had everything taken by the government, it has been even worse. 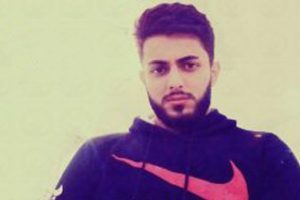 So those Baha’is who have been expelled from their universities, and at the same time face financial problems, have had to concentrate on their jobs just to survive. In this case, they couldn’t further their education, even in the BIHE. Very clever, smart youth – especially girls – couldn’t further their education because their parents said it was not safe for them to travel alone to Tehran. I believe I am not living for myself; the purpose of my life is to help my community, my society to live. At the second level is my own life, my own purpose. Like in a human body, I am just a very small cell. I have my own responsibilities to make this body a healthy one. So when I am faced with these difficulties in my studies, even before university, or after entering BIHE, I thought of this. It is one stage in a process of progressing, or developing, or revolutionizing the community. Ten years ago, when I entered BIHE it was quite poor, there was nothing. At the moment it is a huge university; even though it is not a physical building that you can see as a university, it is a real university, and you can’t imagine – I myself can’t imagine, when I compare it with ten years ago, or even five years ago – we have everything in BIHE at the moment. It just cannot have a building. So is it a type of Open University? Yes, it is very similar to the Open University. Students undertake self study, from their own hometown. Depending on their field of study, they have a few classes where the students come together – with or without a teacher – at least three times a term. What facilities exist for students? Internet and emails are the main facilities. We use Skype as a means of communication between teacher and student. As we don’t have a building, we can have nothing else. It’s very difficult to solve problems when you study alone – fortunately I haven’t been alone at any stage. There have been some students who were alone, with no other BIHE students studying their course in their locality. Our Internet is quite slow, and very expensive, something that not all families can afford. Before the online system came to BIHE two or three years ago, if a student found him or herself to be the only one in his town it was extremely challenging to motivate and teach oneself. Fortunately I have always had some classmates close by. When students are isolated, they try to maintain telephone contact with their fellow students, consulting questions regarding their studies together. Why did you study accounting and finance? I originally wanted to study architecture. I did math and physics in high school, and my calligraphy and drawing is good. I did all of this with the aim of studying architecture. But at the time when I had to choose my field of study in BIHE I found that architecture was not being offered. Accounting and finance was the next suitable option. Why do you not leave Iran? Again, this is not my purpose. I consider myself to be a very tiny cell in the whole body of society. I am here. I was born in this situation, to fulfill this special purpose – to serve people, the most needy. And at the moment I am thinking of the Iranian people as the neediest ones – both spiritually and materially. For example when I was younger I thought of going to a developing country to serve the people. I may go in the future, but even going there will have its barriers, such as language. But at the moment, I love my country. Iran needs to progress and at the moment I live here. I am in Iran, my country is in the most in demand, and I am sure that the first ones whom I am supposed to help are the Iranians. Do you know Baha’i’s who have enrolled in Iranian universities? What has been their experience? For the past four years Baha’is have been able to take the entrance exam, and some of them have entered universities. They have been very successful as far as I know. For the first year, four years ago, it was a Bahá’í student who got the top score in her field in the entrance exam. It was very interesting then when they refused to allow her to enter the university. She was even in the newspaper, and after some days, after they realised she was a Bahá’í they gave the second scoring person the top spot, and removed her name. Are the Baha’is in Iran aware of the international support from the Bahá’í community, and efforts such as the Closed Doors campaign? Yes, we hear about them mostly through local gatherings. As individual Baha’is, when we find information on the internet, for example, we share it at feast. Knowing that Baha’is all over the world are praying for us is a great source of strength and hope. What are your plans when you return to Iran? We first need to find somewhere to live, as we don’t have property. This will be difficult because some real estate agents have been told not to give Baha’is any houses, and we may face this situation. We used to have a house, just as my husband’s family did, but both were confiscated by the government because we are Baha’is – now we have to look for a house to rent. I am going to apply for a job but as we don’t live in the capital job opportunities will be slim. As you know we cannot enter any government-owned companies or civil work, so we have to look for private jobs. Even some private companies refuse to employ any Baha’is. I will try my best. After that, I will start helping BIHE by teaching at BA level. In my field of study we don’t have a Master’s degree yet, so I plan, with the help of other students who will have come back from their studies abroad within my field, to open a Master’s course in accounting and finance. Raise awareness. Find some eager teachers for BIHE. It needs two things: teachers and international assistance to get the government to stop these official policies that turn Baha’is into second-class citizens. The whole Bahá’í community needs support. Thank you so much for sharing this. It’s a moving interview and I hope many people read it to get a sense of what it is like to be persecuted for your faith. Bravo for your steadfastness, for standing up for your faith AND for what is right. According to the Bible, at the end, the meek shall inherit the earth and Gog and Magog (Gorg va Magorg as you say in Persian) shall be no more and peace shall come to all! I am so touched and so proud of you and all the Baha’i students in Iran. Dealing with this situation and being so strong is not easy. I wish all of you all the steadfastness and strength. 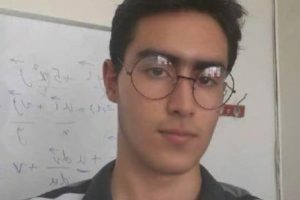 This article should be posted on all the schools and Universities in All the free lands, so students who have everything made possible for them become aware of what their Baha’i brothers and sisters go through in Iran. As Steve said before me, these times will pass and reality will show its face. May all the power and strength be with all of you.